Eid al Adha has come and gone, and so has Amy. 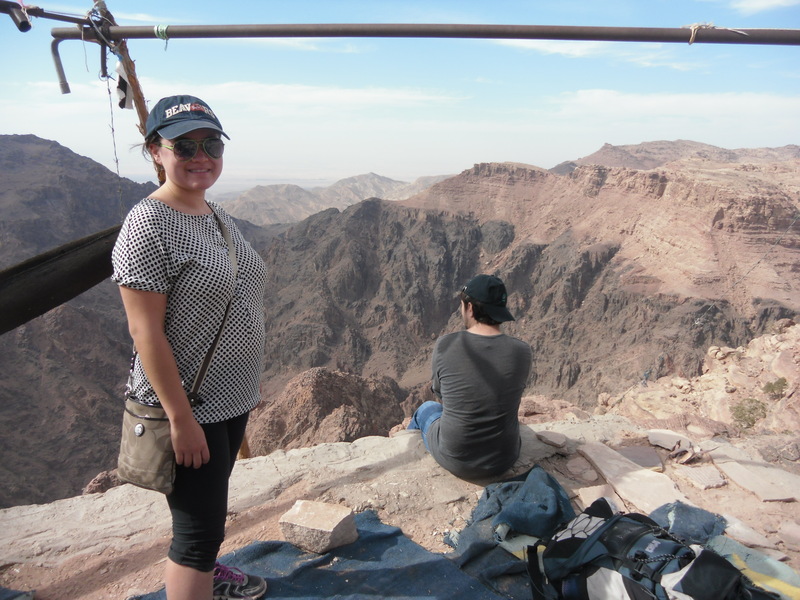 She was in Jordan for just three short days over the break, but we fit in so much during that time. 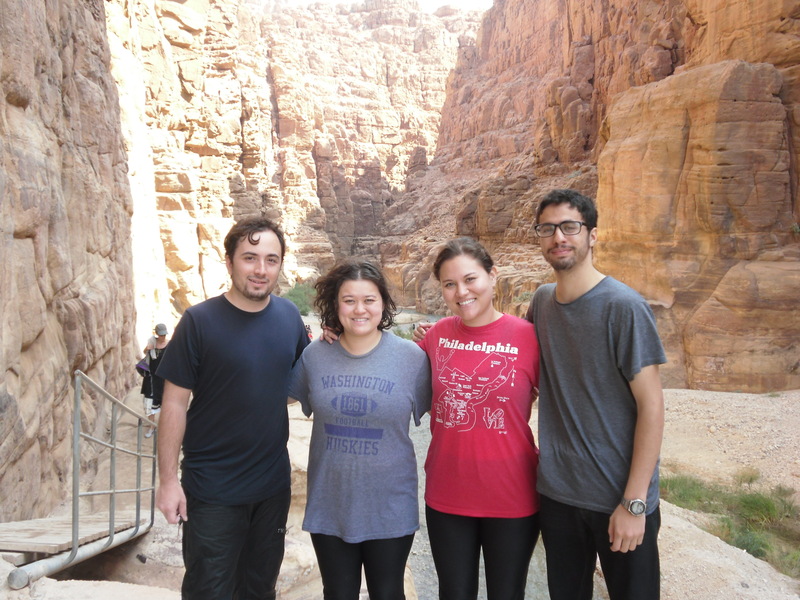 After picking her up from the airport and feasting on Jordanian salads and BBQ chicken and beef, we woke up early on Monday to do the Wadi Mujib gorge hike with Hamza and Faris. 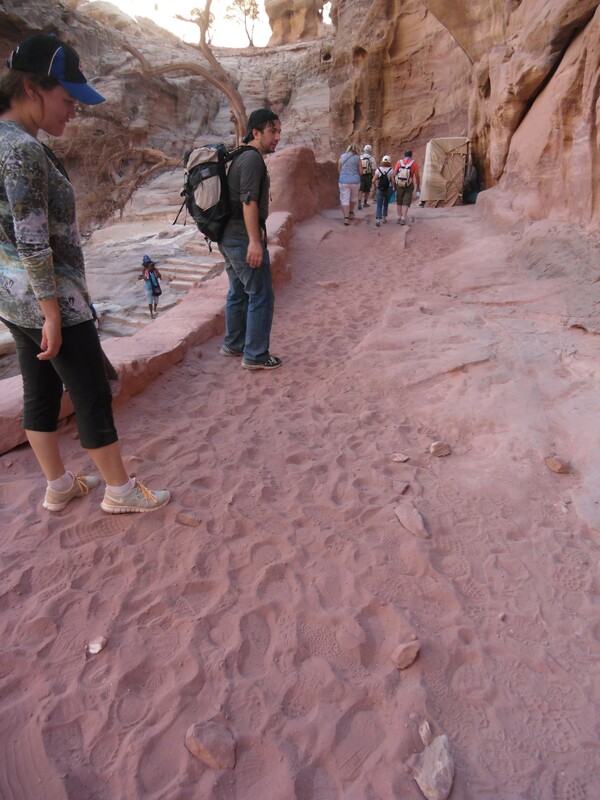 Beautiful Wadi Mujib is one of my favorite hikes in Jordan. 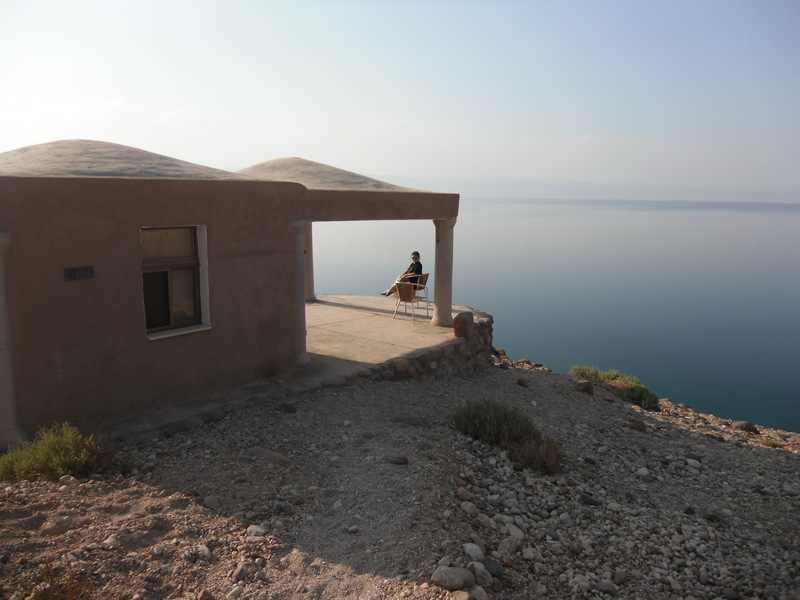 After the hike Amy and I checked into the Mujib chalets across the street and spend the rest of the day relaxing by the Dead Sea. Our “hut hut”: think very comfortable camping. We found some mud on the shore and slathered it on for smooth skin. It did not smell good. 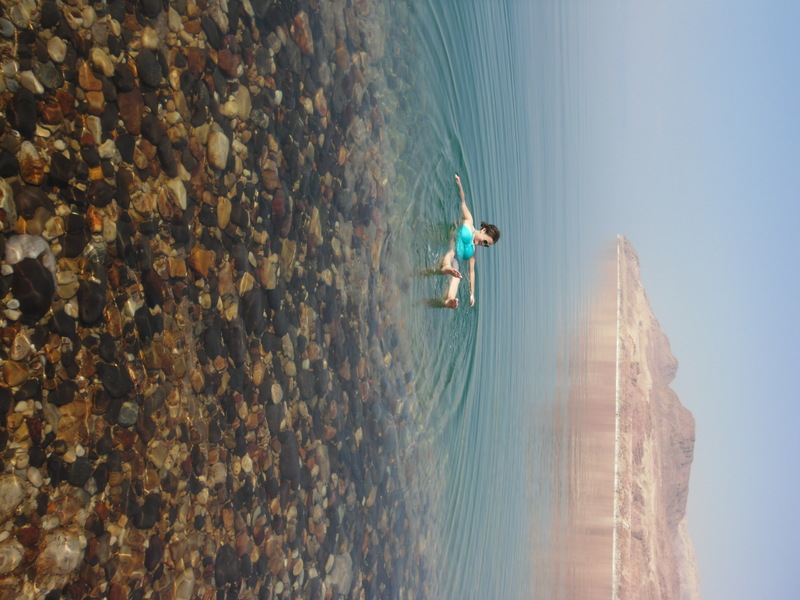 Unlike when I went in hellish-hot July, the Dead Sea in October is absolutely lovely. The next day we woke with the sunrise, had a delicious breakfast provided by the chalets (boiled eggs! coffee! hummus! corn!) and headed off to see the site where Jesus was baptized on the Jordan river. Pricey at 12JDs but its one of those places we had heard about since birth, really, so it was pretty high on our to-do list. 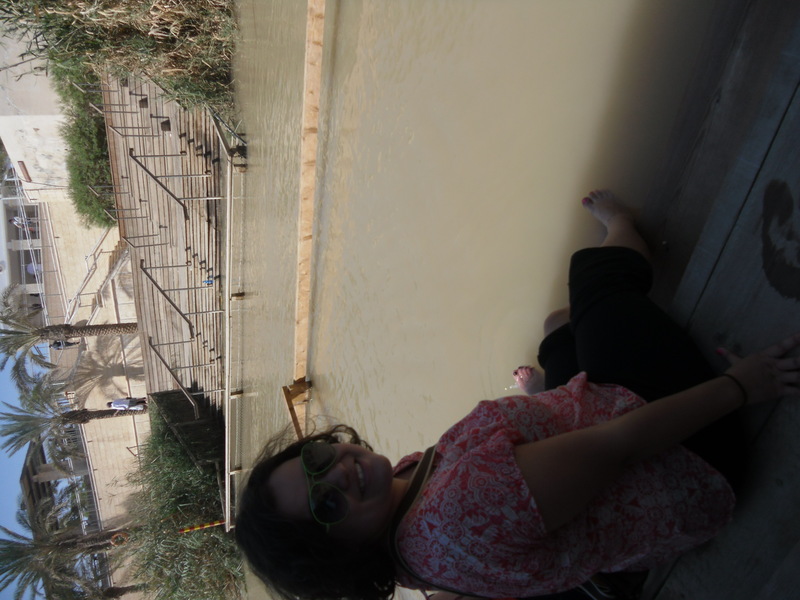 Amy on the Jordanian bank, dipping her feet into the river where Jesus was baptized. The platform across the river is Israeli. We headed back to Amman to see the Citadel, rest up, and have a simple falafel dinner at one of my favorite neighborhood restaurants. 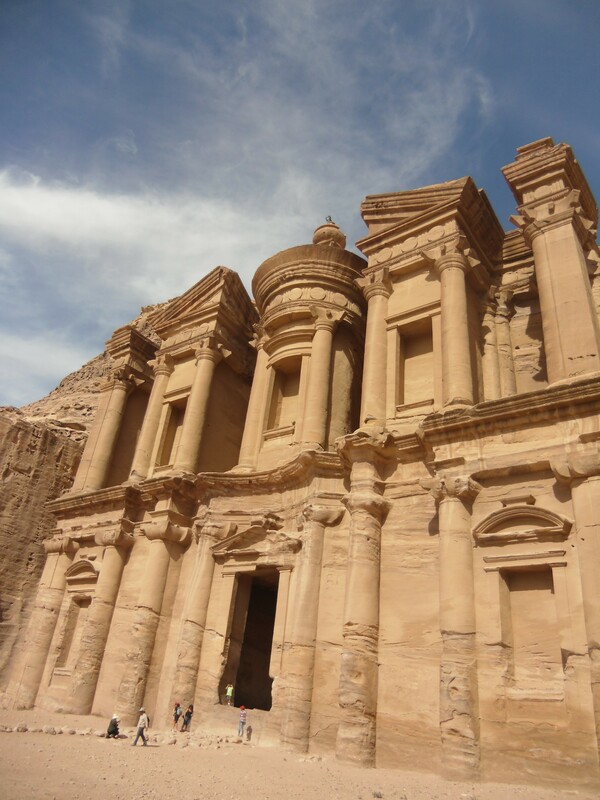 Thursday we forced ourselves out of bed before dawn, met up with Hamza, and drove down to Wadi Mousa and Petra. 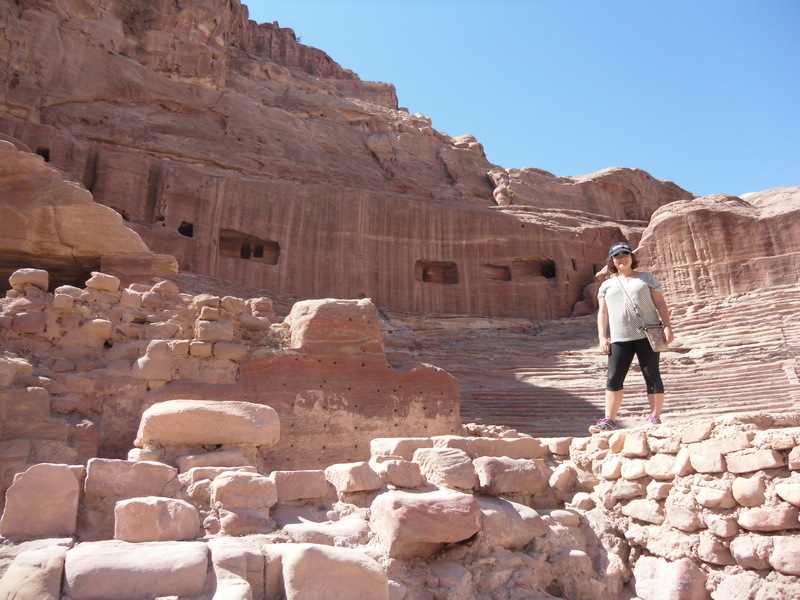 I’ve been in Jordan for nearly 5 months now, but it was my first time into the site. With Hamza’s help and my work ID, I got into the park for the local price: 1JD. Amy’s ticket, being a foreigner, was 50JDs. We paid up and joined the crowds. 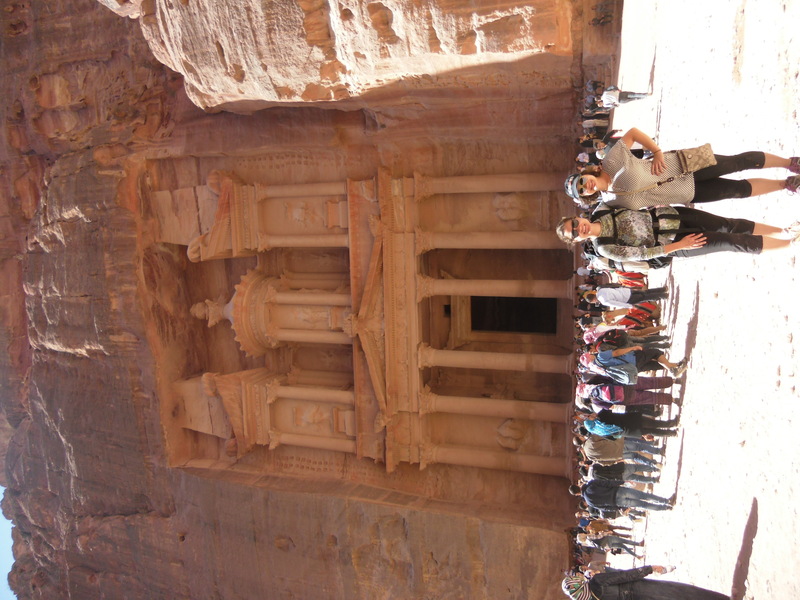 Petra really is worth navigating the ocean of tourists and the high entry fee. It is one of those sites I had seen in hundreds of photos, but they could never really capture the experience of taking it all in for myself. We packed a big picnic lunch and spent the day in the expansive town. Feeling energetic, we took the somewhat strenuous hike up to the Monestary. The hot trek up is worth the view as you round the corner and see this. We scarfed down our picnic at the top of the world. We drove back to Amman the same day. I dropped her off for her flight back to Kuwait early this morning. I’ve started looking forward to setting my alarm for early wakeup on Saturday mornings. 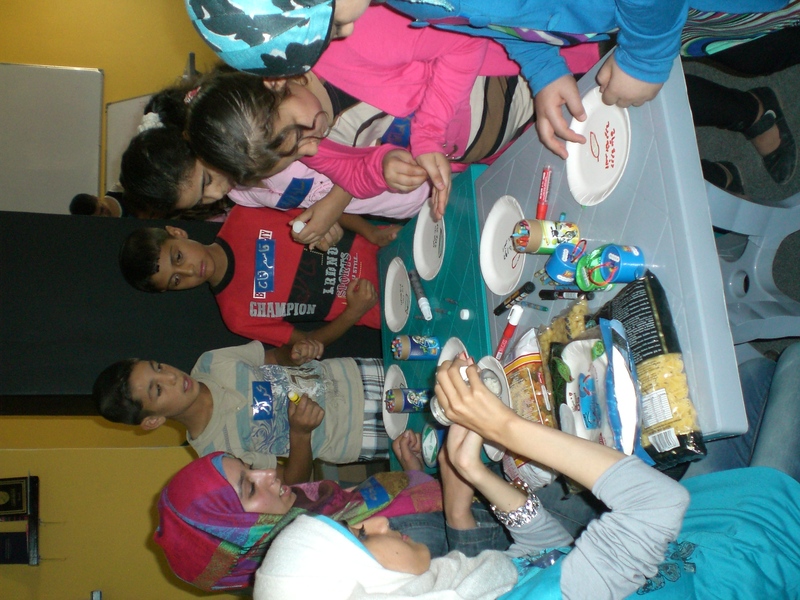 For the past month and a half, the Scientific Cultural Society and I put on a 2 hour workshop every week for Syrian refugee kids in partnership with Syria Bright Future. 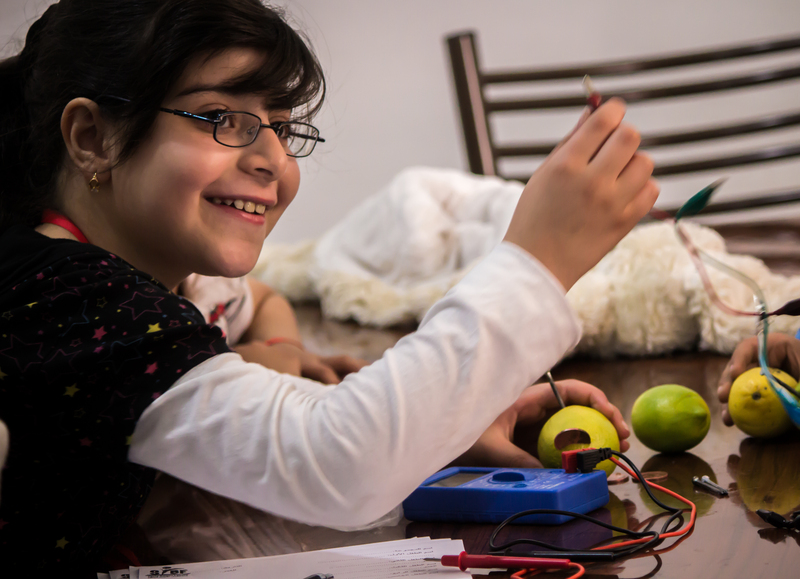 Syria Bright Future is an all-volunteer organization run by Syrian psychologists and psychiatrists to provide mental health services to Syrian refugees in Jordan. 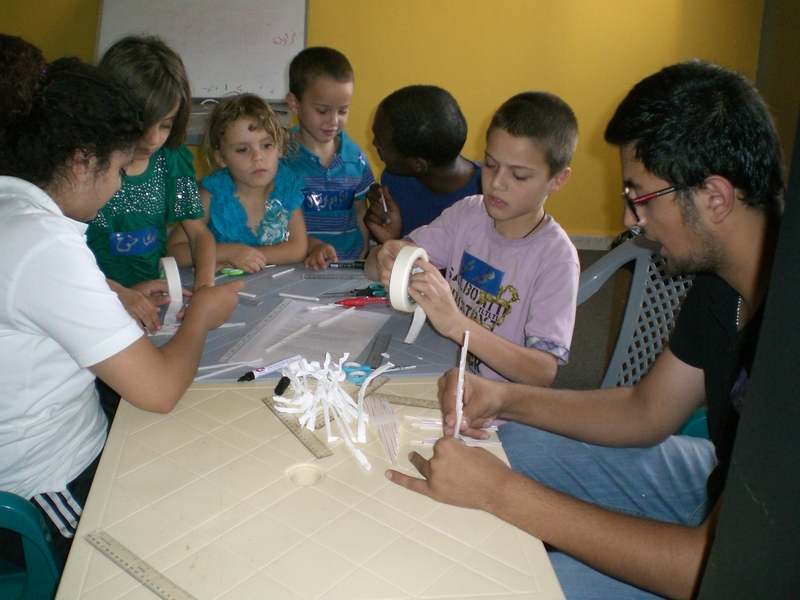 They bring in groups of 25-30 kids every Saturday morning for fun science stations with us. This week, we had five stations: one where kids learned about batteries by creating their own with lemons, pennies and nails. Batteries with lemons, iron nails and copper coins. Kids learned about measurement (and theoretically, vibration) by creating their own pan pipe made out of drinking straws. At one station, kids modeled the lifecycle of a butterfly with pasta. At a fourth station, kids are challenged to build the tallest marshmallow tower possible and to have it withstand a jello earthquake. 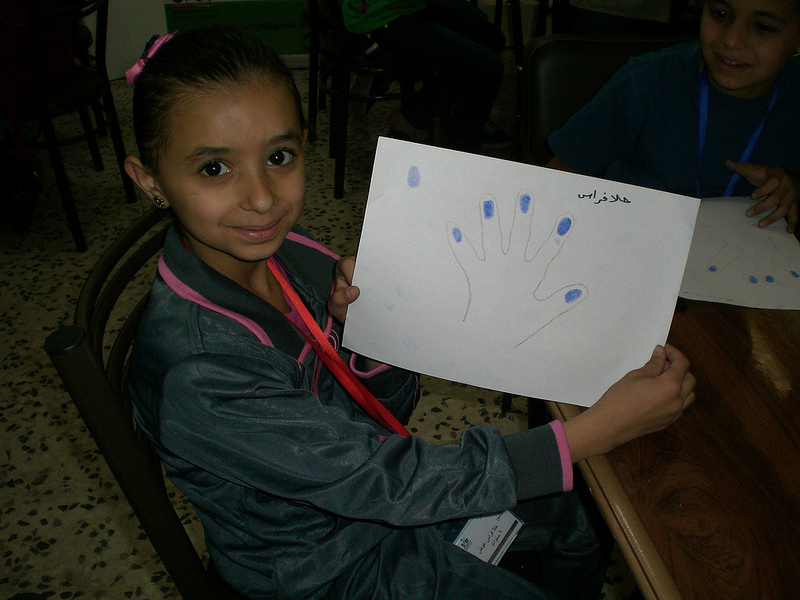 And finally kids learn about fingerprints and investigate the patterns of their own fingerprints. It is my dream to expand the program to include longer sessions and to have kids come back week after week. That way they could really explore in more depth the topics they are interested in, and develop important skills; particularly, the skills used to gather information about the world, the skills needed to make sense of the information they gather, and then the critical thinking skills to apply information in new situations and in solving problems. I’m back to regularly posting on my blog, especially now that I have disabled my Facebook profile for good. I’ve checked Facebook every day for nine years since I created an account as a college freshman at the University of Washington, and it is really time that this habit dies. Since my last post, I have been continuing work with the UNESCO Amman office. I am very lucky that my boss, Claude, has been giving me progressively more responsibility, and this past month I have organized an official donation ceremony, drafted up a contract, processed more than my fair share of payment requests, waded through current project budgets, and what I’m most proud of: writing up a concept note and then a project proposal for a scholarship program for Syrian refugee and vulnerable Jordanian undergraduate students. Whether or not the project will actually be approved and go through is quite uncertain at this point; however, it was an excellent learning experience and a lot of fun to be creative and design my own program. I even got to meet with the Jordanian Minister of Higher Education in the process. I’ve been collecting information from 5 or 6 prospective Syrian scholarship recipients every day at the front door (it has all been due to word-of-mouth) so I hope I can soon post good news announcing that the project will move forward. The internship at UNESCO also allows for a lot of flexibility in my work: just this week I tagged along with project managers from Questscope to observe more Non-formal education centers, this time in Ghor al Safi, a town in the Jordan Valley, Umm Sayhoun, a village neighboring Petra, and around Amman. Each center is quite unique, with their own strengths and areas for improvement, which I’ve been able to understand somewhat more after speaking with facilitators, students, and administrators. 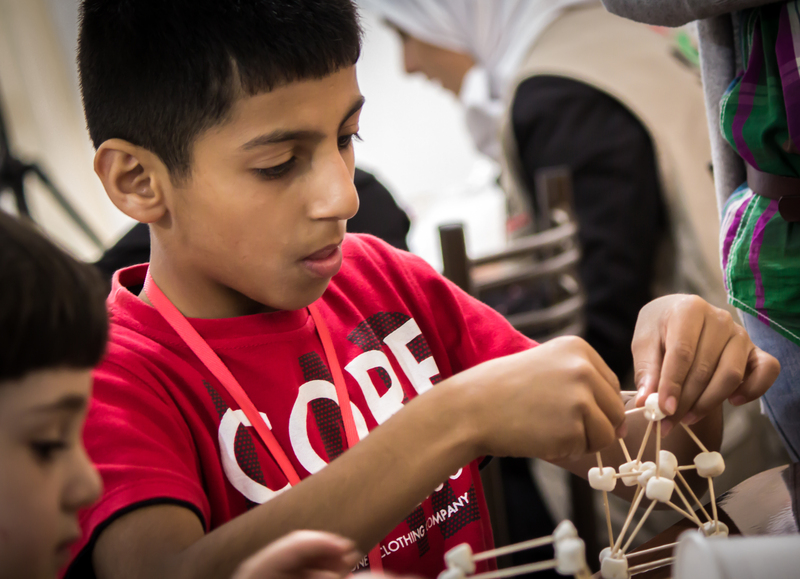 I’ve also been designing hands-on science days for Syrian refugee kids in Amman with my friend Hamza’s organization, the Scientific Cultural Society. 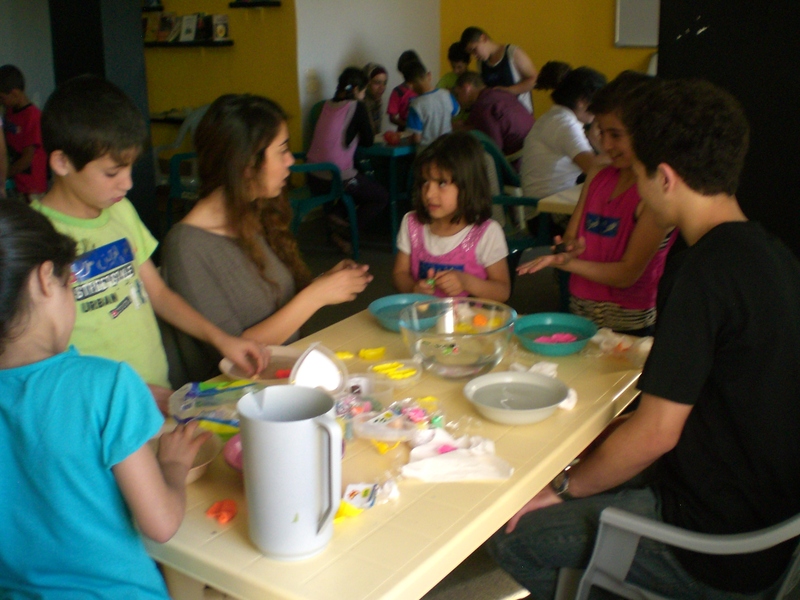 Every Saturday morning we host 25 – 30 kids and have fun with science. 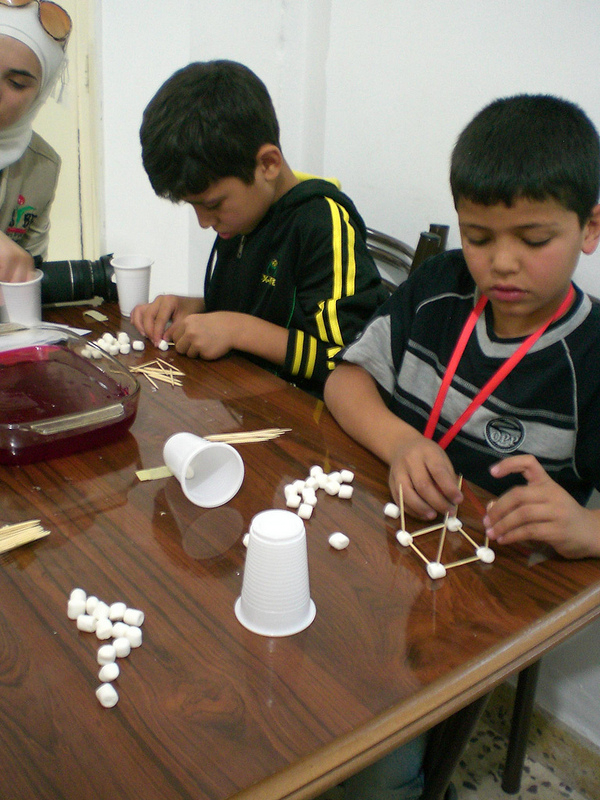 At this station, kids are challenged to build “earthquake”-proof marshmallow towers. Next week is the Islamic holiday of sacrifice, the Eid al Kebir, or Eid al Adha. 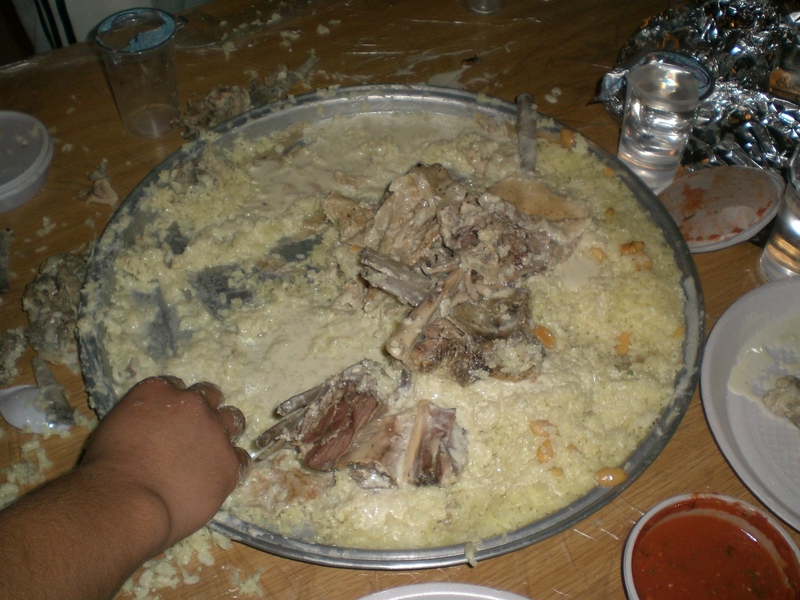 I really enjoyed celebrating this holiday in Morocco in 2010. You can read about how the Eid is celebrated there from two past blog posts. (We sacrificed a calf!) I asked Hamza how his family planned to celebrate Eid: were they going to buy a sheep and, as the oldest male in the household, was he going to be the one responsible for actually doing the sacrifice? He laughed in my face: his family will buy meat from the butcher, he’ll receive envelopes of cash from his grandparents, and he’ll visit family. Hamza’s family may not be sacrificing an animal themselves, but there are pens of sheep all throughout the outskirts of the city waiting to be taken home, so somebody in this city is doing some sacrificing. This year I’ll get to celebrate with my sister. 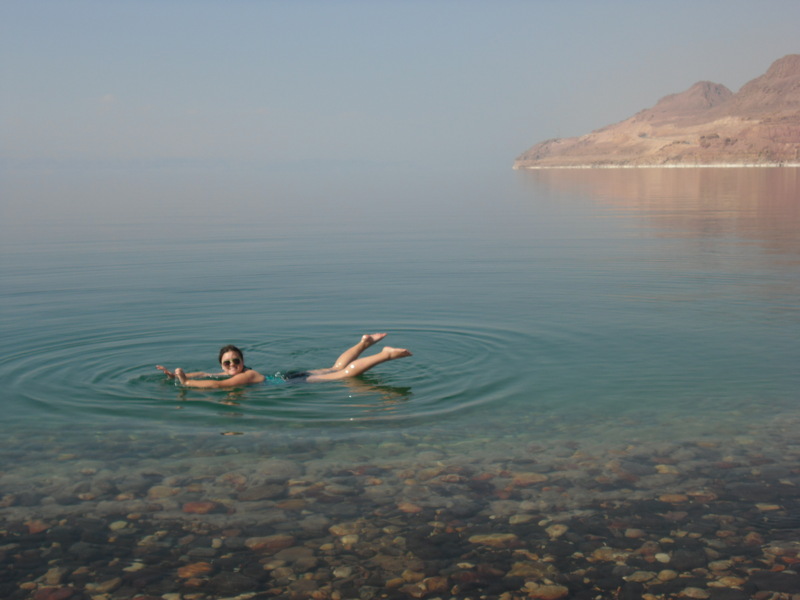 She gets some time off molding minds in Kuwait and will be coming to Amman for a week, so I’ll show her around the city, we’ll float in the Dead Sea, and perhaps road trip it down to Petra. I can’t wait to have her here. This weekend marks the end of Ramadan, the Islamic holy month when Muslims fast from sunrise to sunset. 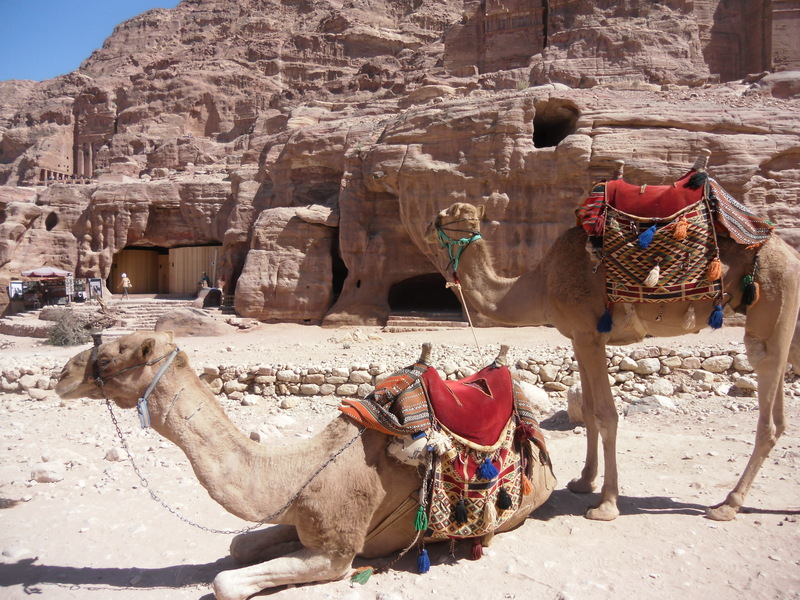 It is a pretty big deal for Muslims as it is one of the five pillars of Islam and a big deal for non-Muslims in Jordan because restaurants close during the day and it is illegal to eat, drink or smoke in public. My favorite part of Ramadan is the iftaar: the big meal that is shared at sunset to break the fast. 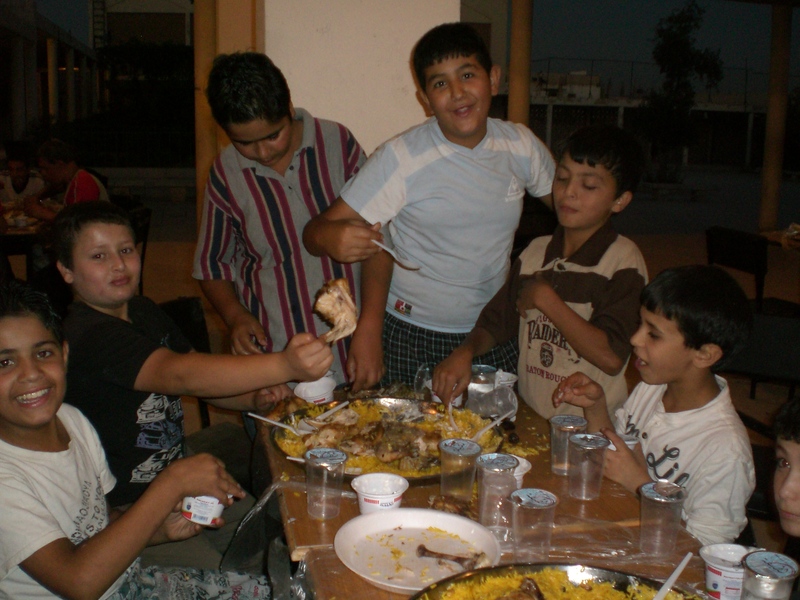 The best iftaar that I attended this year by far was when I accompanied the Questscope team to break the fast with a non-formal education (NFE) center in Al-Rusayfa, about 45 minutes outside Amman. That particular NFE center is very well attended and there were about 40 boys at the dinner along with their facilitators, the Ministry of Education liaison, and the principal and superintendent of the school that hosts the NFE sessions. Last week, after filling out an official UN request for travel, getting my boss and his boss to sign a travel schedule, and submitting a copy of my passport to Questscope, I finally was able to accompany Questscope on a site visit to the informal education and mentoring sessions in Za’atari refugee camp. The Za’atari refugee camp is now the second largest in the world hosting 160,000 refugees, and is located outside of Mafraq, a small town near the Syrian border in northern Jordan. Jordanian towns are also hosting a lot of refugees, and Mafraq’s population is now made up of more Syrians than Jordanians. After just about an hour and a half in the car with two of Questscope’s program coordinators, Tawfiq and Dana, we were at the first checkpoint into the camp. Tawfiq and Dana come to the camp on nearly a daily basis throughout the week to monitor the ongoing programs, so we were waved right in without so much as a peek at me and my papers in the backseat. Yes, IFE and Mentoring sessions are still ongoing throughout the Islamic holy month of Ramadan, although sessions are shortened and attendance isn’t quite at 100%. No, people who are fleeing Syria but are not Syrian (i.e. Palestinians) are not allowed into Za’atari, so all facilitators, students, mentors, and mentees are Syrian. The reason why no one is playing in that “child friendly” piece of land is because the area is totally exposed to the beating sun and families are afraid to let their children play unguarded. 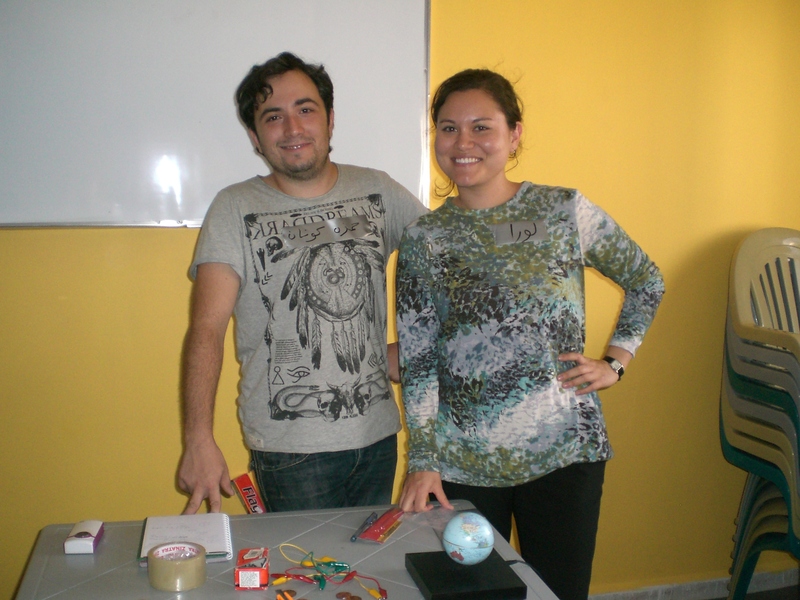 Tawfiq and Dana got on with their work while I observed an informal education session with 16 girls and three facilitators. Because there is no transportation within the very large expanse of the camp, all of the girls live within walking distance from the Questscope compound. I had the opportunity to have an extended conversation with the facilitator: she was a teacher back home in Syria, but was forced to flee, leaving her husband and son behind. She hasn’t received news from them since. Leaving the camp, we sat in traffic for quite some time: apparently the road had been blocked by Jordanians protesting the Syrian crisis. 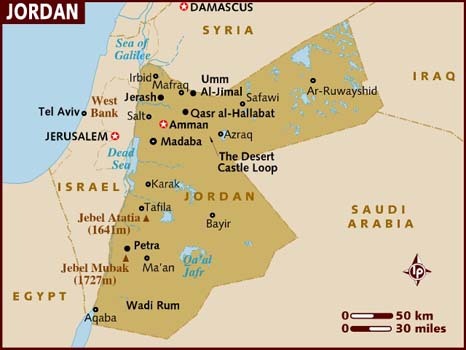 Especially in Mafraq where the Syrian to Jordanian ratio is so high, tension has been building as unemployment rates and housing & food costs rise. Since my last blog post, I have been keeping busy all day at the office and there always seems to be some event or activity after work. 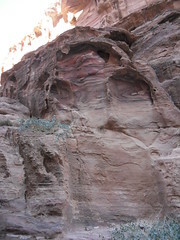 I have not had much downtime since I moved into my new apartment, located in the neighborhood called Jebel el Weibdeh. I have observed five Non-Formal (NFE) and three Informal (IFE) education centers, and am conducting informal interviews with facilitators, Questscope staff, and students. Most students in the NFE program are Jordanian: the program follows a set curriculum and students eventually take an exam that, if passed, will give them 10th grade equivalency. 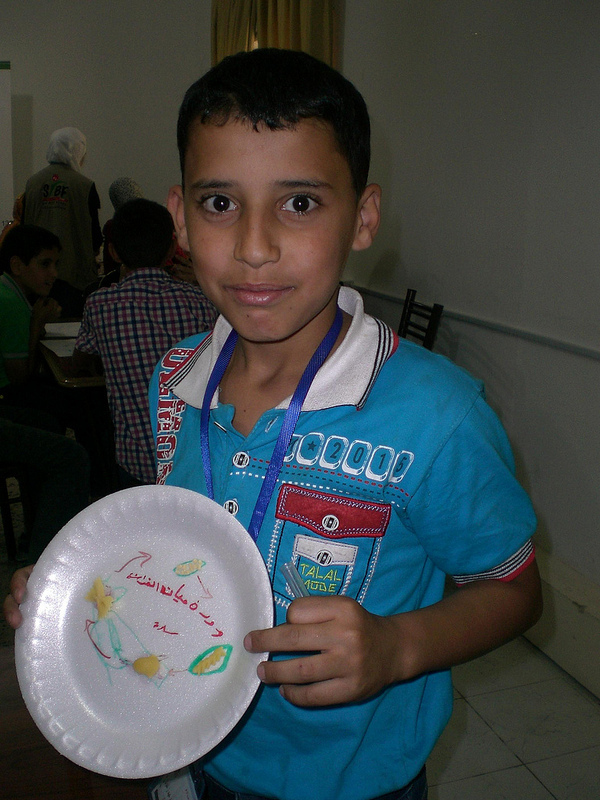 The vast majority of students enrolled in the IFE program, however, are Syrians. The IFE sessions don’t follow a set curriculum, and don’t offer any type of accreditation. Its value lies in its ability to provide children with the opportunity to get out of house (girls especially are often confined to the home), make friends, engage in structured activities, and regain some sense of normalcy with a schedule and routine. I’ve been able to see a lot of East Amman and cities in the north through these visits, including Mafraq, Irbid, and Ramtha. (The IFE site in Ramtha was just a mile or two from the Syrian border). 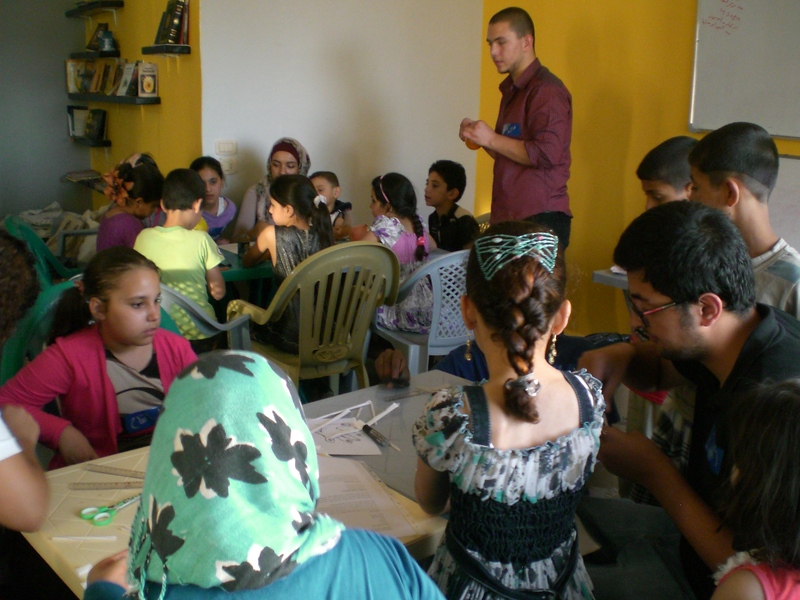 This Thursday, if all goes smoothly, I will be observing an IFE session and speaking with young adults and children involved in Questscope’s mentoring program in the Za’atari refugee camp, situated just outside of Mafraq. 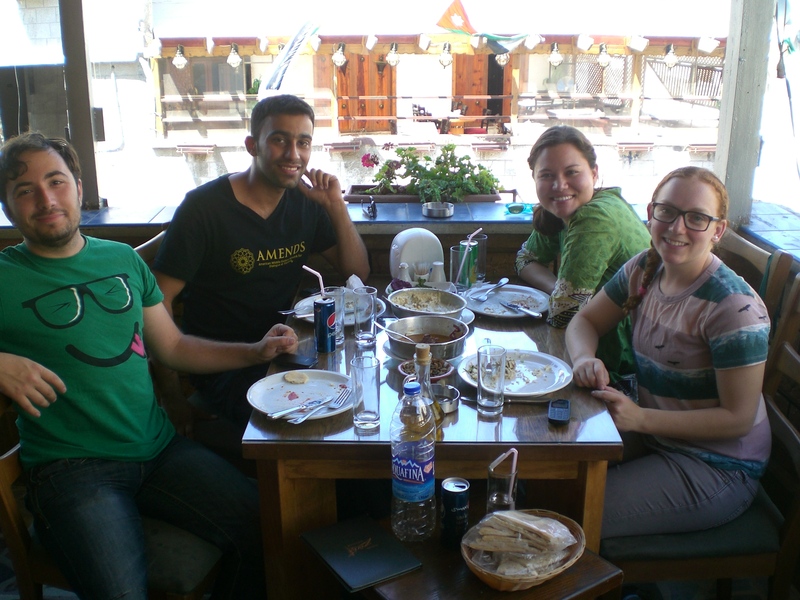 Hamza, Arez, Me, and Amanda: We all met last April at the AMENDS conference at Stanford, and were able to catch up over Jordanian kofta (ground beef with tahini sauce) and salads downtown Amman. 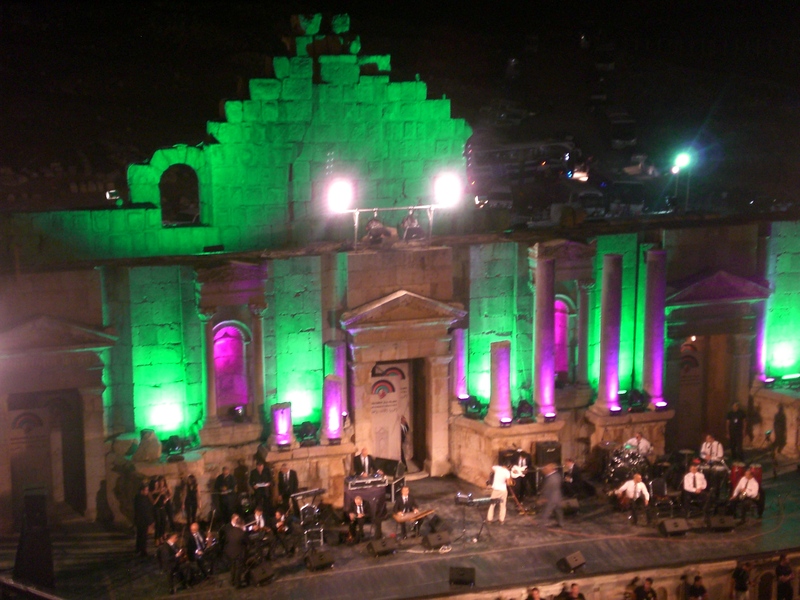 I saw traditional Circassian dancing AND Nancy Ajram at the Jerash festival. At Mt. Nebo, where apparently Moses looked upon the promised land, then died. He is buried up there somewhere. Tomorrow begins Ramadan here in Jordan. I’ve been convinced by my co-workers to give fasting a try, at least for a few days, so I’m giving it a shot, for solidarity’s sake.